Does taking off your shoes, emptying your pockets and putting your laptop in a little plastic bin make you feel safe? Maybe it shouldn’t. 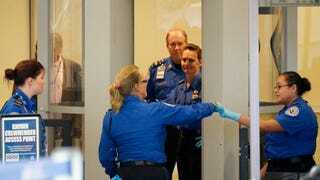 According to the Department of Homeland Security, the TSA is doing a lousy job. Like, “failed to detect mock weapons 95 percent of the time” lousy. That number comes from a recent internal investigation that pitted special Homeland Security “Red Team” members against security checkpoints in a dozen of the nation’s busiest airports. Out of 70 anonymous tests, the TSA managed to catch only three Red Team attempts to sneak fake weapons through airport security. It sounds bad (and it is) but it’s not quite as bad as you might think. Red Team members are fully briefed on TSA protocol. They know everything the checkpoints look for and how they look for it—meaning they can craft near-perfect plans to exploit the system’s potential flaws. In theory, the Red Team’s plans are far and above what a potential terrorist might come up with—but the TSA’s failure to detect all of them is still completely inexcusable.